Chambray is one of my favorite fabrics. It’s just so versatile! 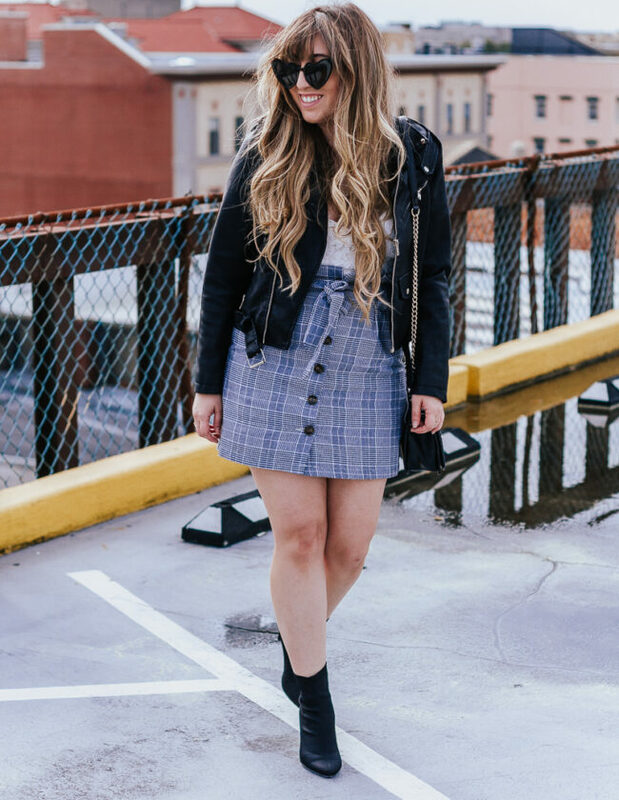 You can pair it with just about anything and it looks pulled together and on-trend. 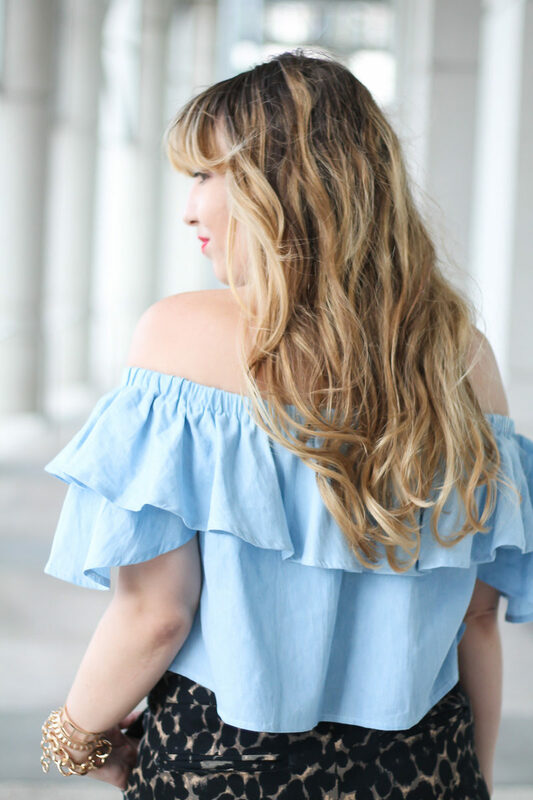 I absolutely love this top because it takes chambray in an unexpected direction and dresses it up a bit. 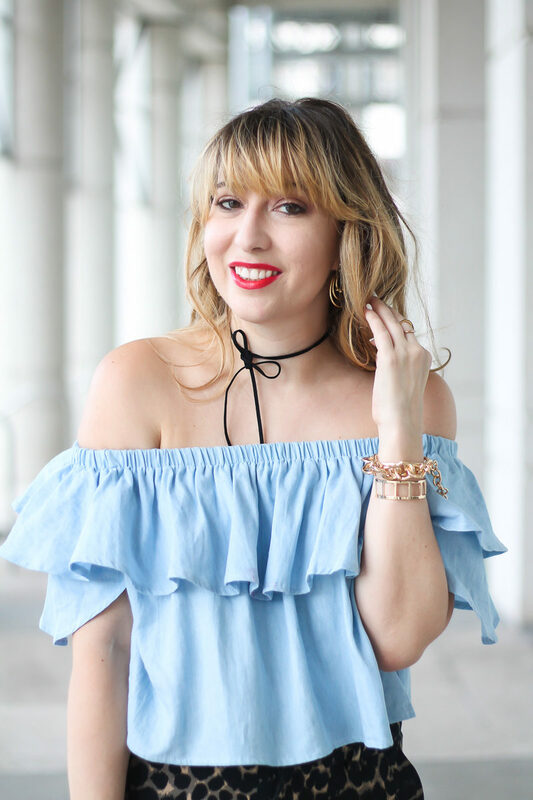 Usually, when you think of a chambray top, you think of a button down, right?! And it doesn’t hurt that the top is only $16.90! 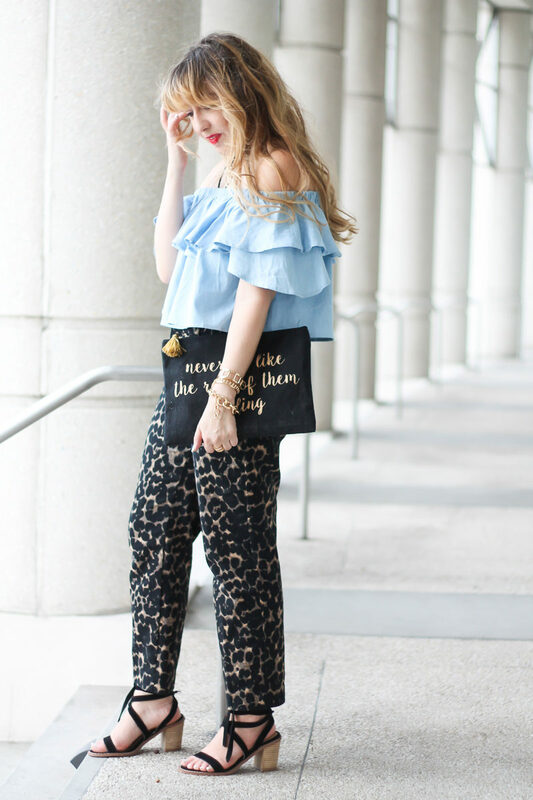 I wanted to put together a look that was a bit more polished, so I paired it with my favorite pair of the Old Navy Harper pants in leopard. Now… truth time. I’ve been intensely on Atkins and I THINK that I probably need the next size down of these pants! I bought them last year (you may remember seeing them here, here, or here!) and I think they’re a little too big now. Didn’t realize until after I wore/shot this outfit. Whoops. At Old Navy, I tend to wear pants in a size 4-6. These pants are a 6 and they’re pretty big on me, so I’d say size down if you’re between sizes.They’re a really great work pant! 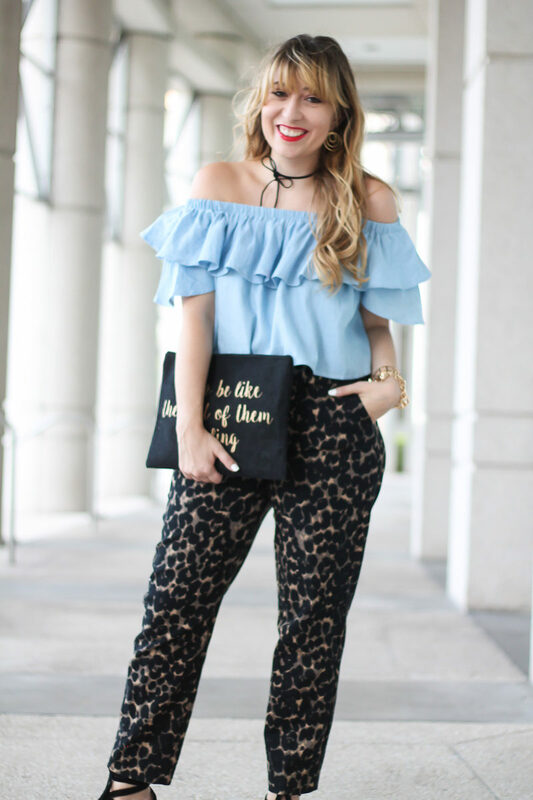 The Old Navy Harper pants come in a bunch of colors and prints. 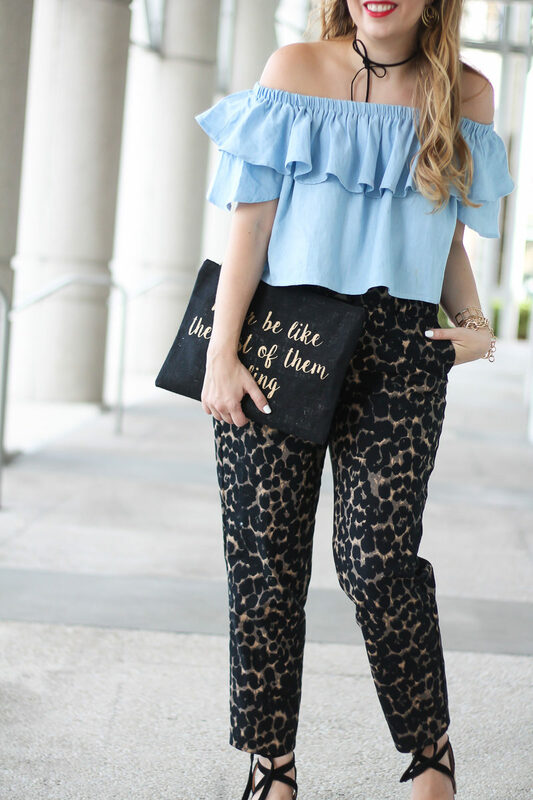 The fit is beautiful and flattering and they never wrinkle or stretch out. You can also order in petite, tall or regular sizes, which is a major plus. BTW they’re on sale today for $25! Also… LOL but it was SO, SO windy so you must forgive my hair in 90% of these photos. By the time I was done shooting this look, I had lipstick all over my top from all the times the ruffle had blown up into my face and I and was basically ready to murder someone. #FashionBloggerProblems. Isn’t this clutch so cute? I got it as a gift from the girls at Mud Pie at TBS Con! Sadly, it’s no longer available online. 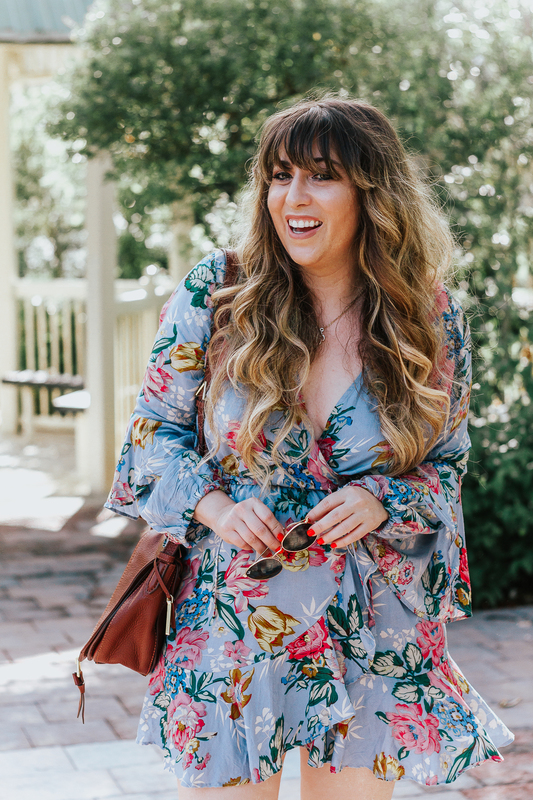 I loved the saying… “Never be like the rest of them, darling.” It’s such a great reminder to be myself, do my thing, and never be afraid to share my story and my vision. 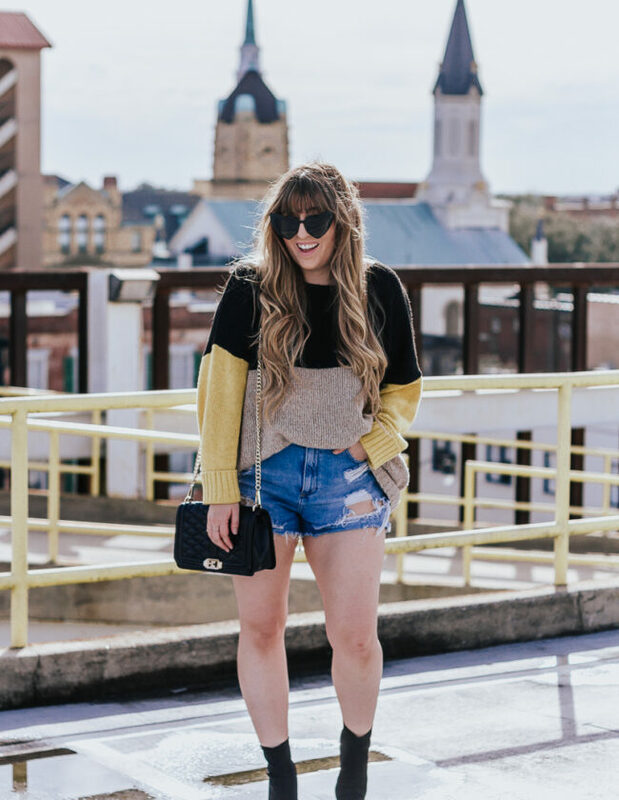 I think oftentimes in the blogging world, it’s so easy to get caught up in what everyone ELSE is doing, posting, wearing. The pressure to be like everyone else is immense. The comparison game is a tricky and depressing one. I can’t even count how many times I’ve felt that pinch, as I scroll through everyone’s perfect feeds and massive followings on my Instagram feed. And I know that isn’t limited to the blogosphere… the comparison trap is one we ALL fall into. Social media has made this an even bigger issue. The truth is, when you start comparing yourself to someone else, you lose sight of all the wonderful things in your OWN life. Being grateful for what you have is key to escaping the comparison trap. Be grateful for your own successes, your own opportunities and your own blessings.Use that pinch to fuel your own success, channel it into hard work and discipline. Don’t beat yourself up when you see that someone else did it better… just use that disappointment to think outside the box and do better next time. Keep your voice authentic and be yourself. We all have a different path and our own unique calling and it’s important to stay in your own lane. All we can do is work hard, be ourselves, and stay true to who we are.